Super Bowl Sunday is this weekend! Pick up easy party add on’s like homemade cookies, chili, chicken tenders, and Cabot dips. Yum! Building your own snacks and apps for the party? Stop in at Barstow’s for local ingredients like Cabot cracker cut Seriously Sharp or Pepper Jack cheese, cream cheese, sour cream, shredded cheese, spreadable cheddar, and local potatoes for potato wedges! Optional toppings: diced avocado, sliced pickled jalapeno peppers, chopped cilantro, more cheese! 1. Cook and stir beef with bell pepper and garlic in large skillet over medium heat until meat is no longer pink. Stir in salsa; simmer 5 minutes. 2. 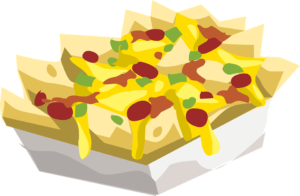 Arrange tortilla chips in single layer on foil-lined 12-inch pizza pan or large rimmed baking sheet. Sprinkle 1 cup cheese over chips. Spoon meat mixture over chips; top with remaining cheese. 3. Bake in a preheated 375°F oven 12 to 14 minutes or until heated through and cheese is melted.